Pictures left to right: Model 304 w/28Ft C-9, Model 304 WWII colors, Red 304, Royal Blue 304. The Model 304 w/ 26Ft container measures 12" Front to Back x 16"Side to Side x 3" Thick & Backpad 1/2". By using an additional Astronaut Foam cushion the thickness of the pack may be from 3" to 6" thick depending on the type of airplane and how high the user desires to be in the cockpit. Add the Optional Static Line for only $45.00 The back pad is only a 1/2" thick, and uses Astronaut Foam padding. The Para-Cushion Seat is recommended for use in airplanes where head room is not restricted and (or) moving forward in the cockpit is not an option such as a Sky Bolt, a Yak 52 (both seats), Yak 55, Stearman, Great Lakes, Pitts S 2B (front seat), & Decathlon type aircraft, and the rear and front seat (depending on body size) of an RV-4. The Model 304 parachute assembly (Seen here with the 3-point harness on the left & the Aerobatic Harness on the bottom photo) is designed specifically for emergency use by sport aviators flying aircraft utilizing a seat pan. The parachute container: Seat & Back Cushion uses "Astronaut Foam" , as well as the Optional "Travel Cushion". 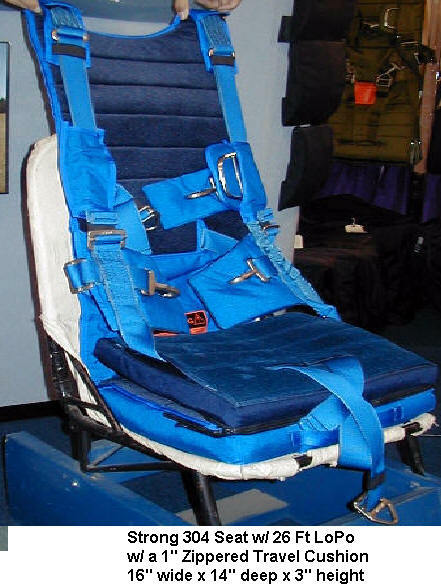 Because the back pad is only less than 1/2 inch (1 cm) thick of "Astronaut Foam", the system is especially suited to aircraft with restricted stick or rudder travel, it replaces your present seat cushion, and when head room is not restricted, such as Stearman, Pitts S1/S2,Great Lakes, Citabria, Casa. Rated at 254+ lbs at 150Knts (180 MPH), The Strong is the toughest chute on the market. The complete system weighs approximately 15-18 lbs. (6.5 kg.). A zip-on 4" (7 cm) "Astronaut Foam" padded Travel Cushion is an optional accessory.